If you are a surfer or sailor you are probably familiar with the name Hobie. You use it, you trust it, you own it. We are big Hobie fans, in fact we own two Hobie’s. We tend to lean more toward the sailing aspect of it and forget that there is a whole other side to Hobie, the surfing side. If you asked a surfer about Hobie, they could probably tell all about their surfing products and might forget there was a sailing side to it. Why? Why do the sailors and surfers tend to be in such separate categories? I think it’s because we live and breathe in different circles. But we have two things in common, we live on the water and we both are avid Hobie users. 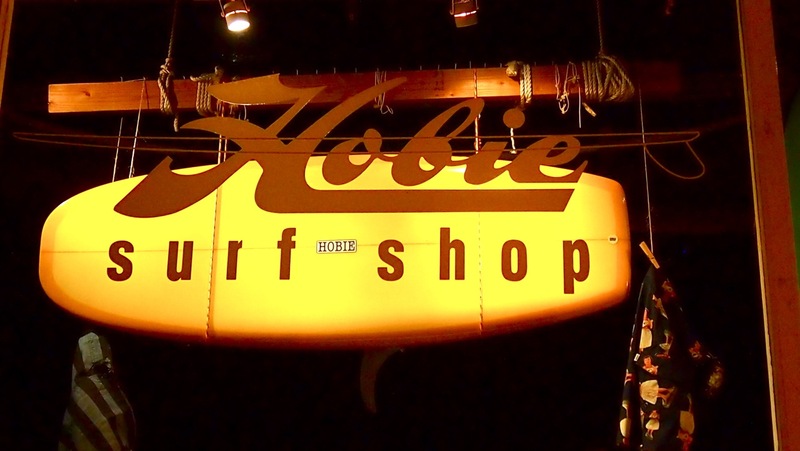 When I was in San Clemente, CA a few weeks ago I stumbled upon this Hobie surf shop. I was so excited to go in, but due to the unfortunate timing of my discovery, I found this shop two hours after closing. Reguardless, I took some pictures to document my trip and peeked into the window and looked them up when I got home. Turns out, Hobie has several surf shops all up and down the Southern California Coast where they sell lots of Hobie products. A Hobie surf shop has everything the southern California surfer needs, and there is always fun for the sailor too. I think Hobie has found a way to bond the sailors and the surfers. Click Here to get to their website for Hobie Surf Shops. If you’re ever in San Clemente take a drive downtown and let us know what you think.